As part of my recent trip to Canada, I spent three days in Jasper, Alberta. Jasper is a stunning place to visit. 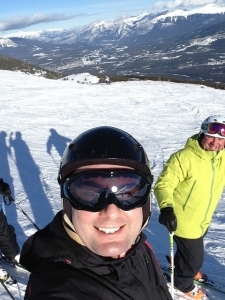 The mountain views are incredible, the people are super friendly and the skiing, at Marmot Basin, is awesome!! Our group of instructors are having a great season so far. I’m pleased to report that everyone passed their CSIA / CASI Level 1 exams and are now working hard towards the Level 2 exams in March. 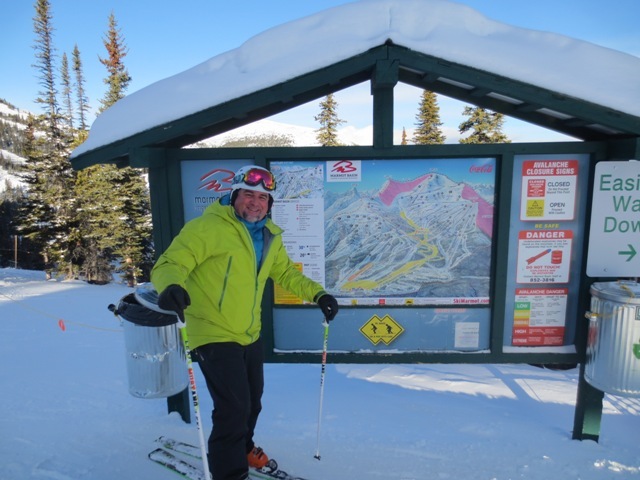 I’ve visited Jasper before but I didn’t get a chance to ski at Marmot Basin on my previous visit so this was something I was really looking forward to trying this time round. I was not disappointed! Since we began working with Marmot Basin, I’ve known that the resort has the highest base elevation of any ski resort in Western Canada at 1698m (meaning that if it is raining elsewhere, chances are it’s snowing at Marmot!) and that the powder is immense! What I hadn’t quite appreciated is how much space you have on the mountain. I skied on a Saturday during the ‘Jasper in January‘ festival and this was apparently the busiest day of the season, yet there was plenty of space up there. We had to queue for the lifts for less than two minutes (absolutely fine by me!). Paul, local resident and Oyster representative, kept apologising for the queues. He really didn’t need to! During the week, the resort is even quieter and there are no lift queues at all! 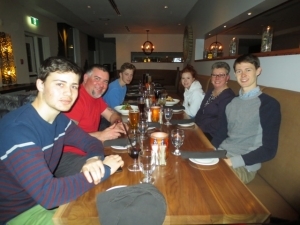 This makes Marmot Basin an ideal resort for taking part in our ski or snowboard instructor course – lessons take place Monday-Friday and you spend your time skiing/boarding, not queuing! The other added benefit of skiing in a quiet resort, that enjoys awesome snow, is that powder lasts for days! Even two or three days after a huge dump of snow, you will still find fresh powder to ‘play’ in. The ‘authentic mountain town’ of Jasper itself is a great place to be based. Our participants stay at the Chateau Jasper, owned by Mountain Park Lodges. The town centre is a short walk away and has all the amenities that people need for a season. There’s a supermarket, launderette, ski shops and plenty of bars and restaurants. One of my personal favourites was Tim Hortons! We are now taking bookings for our 11 week ski and snowboarder programmes starting on the 7th January 2017. Whether you are on a gap year or career break, get your name down to secure your place! I can’t wait to visit again!